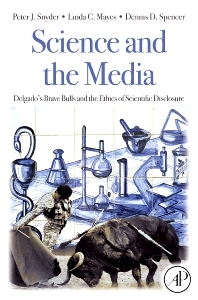 Of great utility for every scientist faced with publicizing their discoveries via the media, this book addresses questions of responsibility for the balance and accuracy of scientific reporting, and attempts to be a guide for the scientist in their quest to inform the general public about their research in honest, truthful, and still interesting ways. Case studies by leading scholars in the fields of bioethics (pharmaceutical research (Declan Doogan, Senior VP Pfizer), medical journal editing (Jerome Kassirer, former editor of NEJM), science journalism, philosophy of science, history of medicine (John Warner, chair history of medicine Yale), public health (Ruth Katz, Dean public health, George Washington University), and philosophy of religion (Reverend Wesley Carr, former Dean of Westminster) illustrate positions and points of view and offer unique perspectives on the complex dance between science and the media. Provides a compelling overview and analysis of the difficulties of dealing with mass media and collects tips and solutions. practicing scientists of all disciplines; scientific journalists; text for use in graduate level courses on medical and research ethics; text for use in professional schools of journalism and communication; also be of interest to historians of science, members of institutional review boards, and to graduate and medical students across a wide range of fields of study. Prof. Linda C. Mayes has served as the Special Assistant to the Dean, Yale School of Medicine (New Haven, CT) since 2008. In this role, she is also responsible for management of scientific integrity for the medical school and its faculty who are spread across affiliated hospitals. Dr. Mayes is the Arnold Gesell Professor of Child Psychiatry, Pediatrics, Psychology, and Epidemiology and Public Health in the Yale Child Study Center, and her research integrates perspectives from child development, behavioral neuroscience, psychophysiology and neurobiology, developmental psychopathology, and neurobehavioral teratology. She has published widely in the developmental psychology, pediatrics, and child psychiatry literature. Dr. Mayes is also trained as an adult and child psychoanalyst and is the chairman of the directorial team of the Anna Freud Centre in London as well as the coordinator of the Anna Freud Centre program at the Yale Child Study Center.